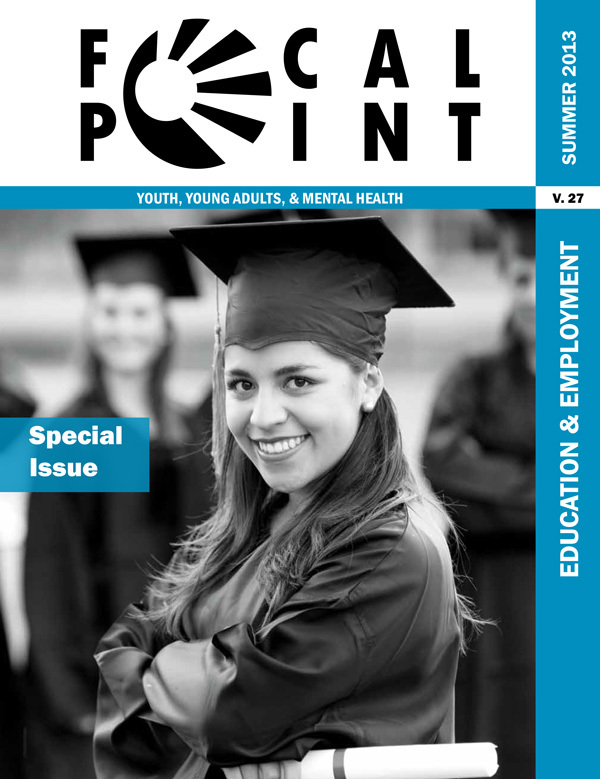 This special issue of Focal Point focuses on best practices for helping youth and young adults with mental health challenges reach their educational and employment goals, by highlighting preliminary results from some of our research at Pathways to Positive Futures as well as some of the work being done at the Transitions RTC at the University of Massachusetts. The editor ofFocal Point discusses the non-linear career paths common for many young adults as an introduction to articles that describe programs and practices that help young people attain their educational and career objectives. This article argues for adapting employment service models such as Supported Employment to meet the needs of young adults with mental health conditions by replacing the immediate job placement requirement with lengthier training and education that are more likely to lead young people into independent, fulfilling careers and help them achieve mental health recovery. Research on high school students with emotional disturbance found better school attendance and engagement among those who received special education services at school and more culturally sensitive services in the treatment setting. Participants who completed the Opt4College program, an online curriculum that educates youth on the practical considerations of pursuing higher education, reported developing greater self-advocacy skills and knowledge about sources of financial support as a result of the training. This article describes Career Visions, a project of the Pathways Research and Training Center that assists young people with mental health difficulties to work toward career goals by creating and implementing step-by-step plans with the help of a career guide. A young adult explains how the Career Visions Project helped her overcome barriers, become more comfortable with job interviews, become more self-determined, and eventually garner a full-time career and acceptance to graduate school. This article advocates for combining the tenets of Supported Employment and Supported Education to help achieve better educational and employment outcomes for transition-age youth and young adults. Managers at the Transitions RTC at the UMass Medical School discuss their experiences and strategies in providing leadership and support for young adults with mental health conditions employed at their Center. Four young adults employed with the Transitions RTC at the UMass Medical School describe how they have succeeded in their positions through self-advocacy, personal ambition, and the support of the managerial staff. Data Trends: Is Supported Employment Effective for Youth and Young Adults? This Data Trends reviews a study that found that Supported Employment can be effective for young adults aged 25-30, but not for youth aged 18-24; possible explanations for the results are considered. This article discusses strategies that Vocational Rehabilitation agencies can use to better support youth and young adults with mental health conditions to achieve employment through their services.